By Joe Zoyhofski — Social Impact 360 Fellow; Gabelli School of Business, Class of 2021; Social Innovation Collaboratory Student Leader. Your passion is contagious— this was the theme of the Social Impact 360. Bootcamp was a day filled with great speakers and collaborative activities. Over 20 students arrived at the MFA Design for Social Innovation at the School of Visual Arts at 9:00am to begin the day. 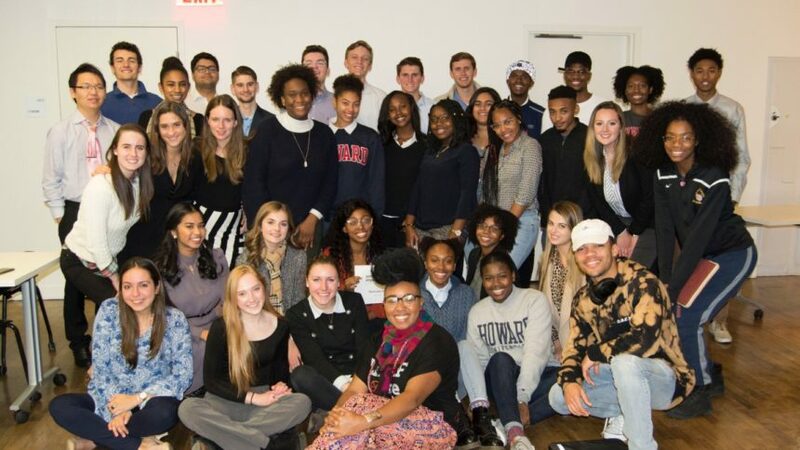 When we arrived, we shared bagels and stories with students from Howard University’s Social Impact 360 chapter who commuted all the way to NYC for Bootcamp. In total, there was about 50 people in attendance, including some Fordham and SI360 alumni. Adarsh Alphons kicked off the day with an engaging presentation on his journey into social entrepreneurship, specifically at the intersection of education and art through Project Art, Inc. He told an inspirational story about growing up in India, overcoming academic struggles, and finding ways to pursues his passions in his career. His insights showed us that creativity cannot be automated and it is our job as social entrepreneurs to dare to think differently. Adarsh reminded students that entrepreneurship is the intersection of business and creativity, and encouraged students to use business as a medium of expression and ingenuity. Afterwards, students paired up with a fellow from a different school to brainstorm venture ideas and discuss their passions. About a dozen courageous volunteers pitched their ideas to the group! Following a break for lunch, we had a riveting alumni panel that showed the different trajectories students can take from SI360. The panelists reiterated that whatever industry students decide to work in, they can utilize the resiliency and communicative skills acquired from SI360 to incorporate socially innovative practices into their business or organization. I cannot thank the following Fordham SI360 alum enough for donating time on a Saturday afternoon to give back to the fellowship: Jordan Catalana (Assistant Manager of CSR at Kenneth Cole Productions and Co-Founder of Puppies N’ Pints), Ross Garlick (Analyst at JP. Morgan), Joe Halpin (Analyst at BlackRock), Chloe Potsklan (Cyber Risk Consultant at Deloitte), and Enzo Obeso (Fordham Senior and Founder of Ventir). Next, we had a fantastic session with Cortina Jenelle (Founder & Creative Director, SOLEIL), who taught the fellows about incorporating authenticity into business, branding, and leadership strategies. Her interactive session provided great insight into how to create measurable impact! The day wrapped up with a presentation from none other than Eddie Cullen. Returning for his 3rd year in a row, he explained how he found success as a social entrepreneur, including the challenges, the failures, and the triumphs. He also led us through the steps of a design sprint. We wish him the best of luck with Bronx.Tech and his journey to meet the Pope in December! We were so thankful to have had such an amazing location this year! Thanks to the generosity of the Design for Social Innovation at the School of Visual Arts, we were able to have a fun, dynamic setting. Chessa Cahill, the Director of Operations at DSI, was present throughout the day and shared information about the DSI MFA program. I also want to thank the Social Innovation Collaboratory and the Fordham Foundry for sponsoring our breakfast and lunch. We truly appreciate you supporting our program and sharing our passion to develop the next generation of changemakers. Finally, I would like to thank Dana Nelson for planning and organizing this year’s Bootcamp activities. I’m so grateful that I had the opportunity to participate in such an educational and inspirational experience. At the conclusion of the event, Dana told students that she “truly appreciates all the enthusiasm that was shared – your passion is contagious!” She was right. Seeing so many passionate students and professionals working together to discuss how businesses can solve societal problems left me inspired and determined to do more. I am confident that, someday, we will all create positive change in the world.